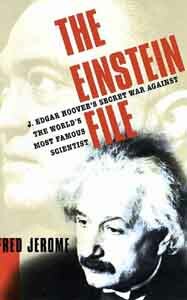 From the moment Albert Einstein arrived in the United States in 1933, the year of the Nazis' ascent to power in Germany, until his death in 1955, J. Edgar Hoover's FBI, assisted by several other federal agencies, began feverishly collecting "derogatory information" in an effort to undermine the renowned physicist's influence and destroy his reputation. For the first time, Fred Jerome tells the story in depth of that anti-Einstein campaign, explains why and how the campaign originated, and provides the first detailed picture of Einstein's little-know political activism. Unlike the popular image of Einstein as an absentminded, head-in-the-clouds genius, he was in fact intensely interested in the larger society and felt it was his duty to use his worldwide fame to help advance the cause of social justice. Einstein was a fervent pacifist, socialist, internationalist, and an outspoken critic of racism (he considered racism America's "worst disease"), as well as a friend of celebrated African Americans Paul Robeson and W. E. B. Du Bois. Einstein dared to use his immense prestige to denounce Joseph McCarthy at the height of the feared senator's power, and publicly urged witnesses to refuse to testify before the House Un-American Activities Committee (HUAC). Unable to destroy him or to intimidate him for speaking out against injustice while he was alive, the authorities found another way of muffling his voice: After his death, they turned him into a saint.